A wind shift out of the north-northeast at the immediate coastline in southern New England has brought sporadic snow showers for southeast Massachusetts, the Cape & Islands, RI, and as far reaching as eastern Conn. Otherwise, the rest of the region is only dealing with a mix of sun and clouds. Today, we’ll still see snow bands developing off the ocean for southeastern Mass, with a few that could pop up in southern New Hampshire. Otherwise, expect a partial clearing of the skies in northern New England where temperatures will warm up into the upper 30s to low 40s, while southern New England will struggle to make it out of the 30s due to that onshore wind and mostly cloudy skies. Tonight, we’ll see a gradual clearing of the skies - as well as a drop in temperatures with lows into the teens along the Canadian border, and lower teens to mid 20s in southern New England. A dome of high pressure will be gracing us with a quiet start to the workweek, but also remaining on the unseasonably cool side with highs near 40 Monday - but at least we’ll see the return of sunshine for all. The sun sticks around for most of Tuesday before clouds roll in ahead of our next system. That could bring some afternoon showers by Wednesday. With these showers, along a warm front, we’ll likely see mostly rain across the region, with a few showers mixing in the higher elevations of northern New England. The warm front ushers in the mild, spring-like weather we’ve been patiently waiting for. Expect highs near 50 Wednesday, and then mid to upper 50s Thursday with a few spots reaching 60! However, that warmth does not look like it will be with us for the holiday weekend. Friday brings windswept rain showers with highs into the 50s. As that system slides north of the area Saturday, it will bring a soggy start to the weekend and slightly cooler temps with highs in the 40s both weekend days. It remains breezy for Easter Sunday with some lingering showers in far northern New England, and drier for southern New England so don't cancel any of your outdoor Easter plans just yet. 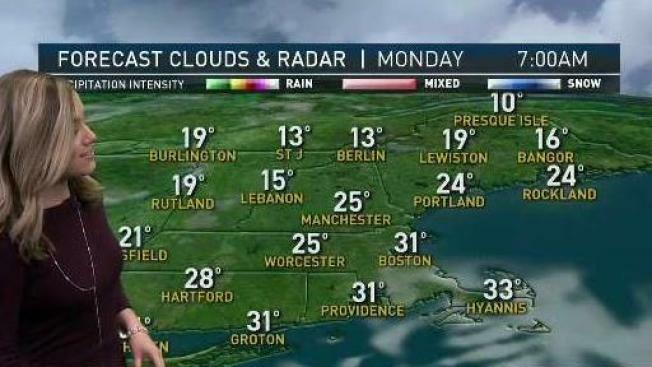 In the meantime, stay up to date on the latest forecast by downloading the NBC10 Boston / NECN app right on your phone.